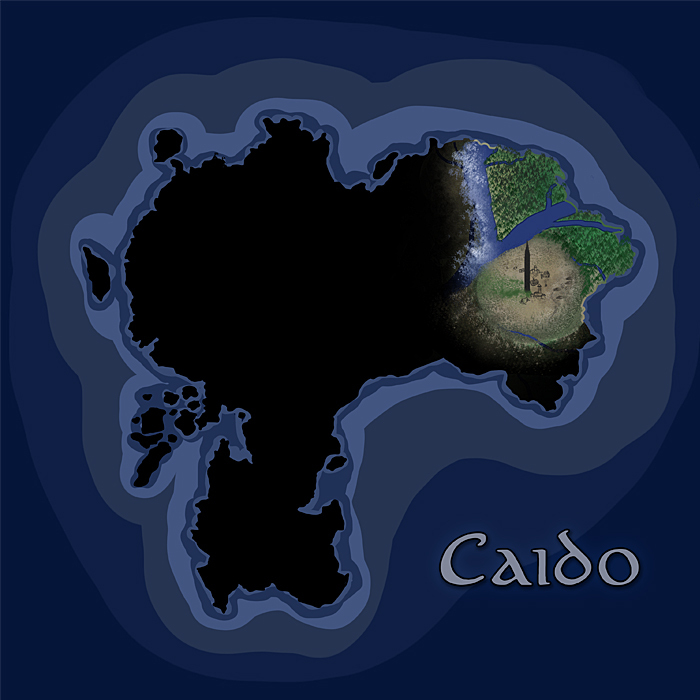 The Hollowed Grounds were 'discovered' by a group of characters who were suddenly pulled from their former lives and onto Caido, during the Where Angels Fear to Tread SWE. Currently the reason why they were 'chosen', if indeed they were, is uncertain as is who might be responsible. 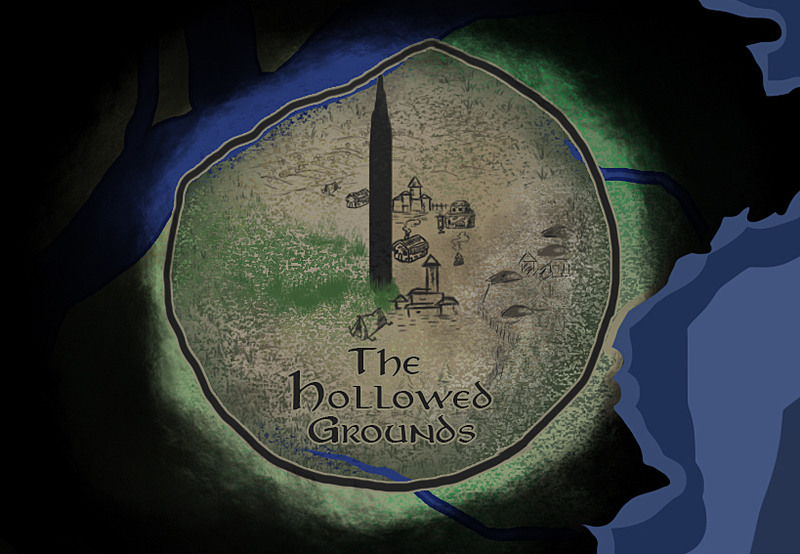 The Hollowed Grounds appear to be a largely decimated area currently encased by a hazardous magnetic field. Though death results to those who linger near its borders for too long, it is apparent that the world outside appears far less devasted than the area within. At the conclusion of the Spire Plot, our characters finally managed to lower the magnetic barrier that had been surrounding the Hollowed Grounds for over 300 years, in The Core and the Voice. However freedom from the barrier was not so straightforward. To the south violent sandstorms and rock-walls emerged that proved impenetrable, while to the west raging elemental storms continued ceaselessly. The only way to go was north, into the Greatwood. Though this enchanting forest is large, it is not easy to find. Magically warded by the Fae, only those who know the correct paths will ever be able to find themselves in the heart of this lush magical kingdom. Wanderers will simply find themselves turned around and spat out after having delved only a few hundred feet or so into the woods. The area immediately around the Spire is little more than a barren waste. A fine, black dust covers the ground - a mix of ashes and sand which, when kicked up by footsteps, can sting the eyes and clog the throat. Nothing grows here - the air tastes dry with death. There is no birdsong, no insects, no life. The ruins immediately around the Spire have been tamed by the new arrivals, creating a refuge in the chaos. Buildings have been renovated, repairs have been made to the streets and there are even a few rudimentary attempts to decorate. Infirmary Situated at the back of the temple, the infirmary consists of a few rudimentary treatment rooms, a primitive ward and a large study. Rathskeller Situated in the Temple cellar, this is the name given to the makeshift tavern that has been set up there. It can be accessed via the Temple but also through cellar doors outside which open into a short tunnel, and then the Rathskeller proper. Atheneum: A domed building which has caved in on one side. The half which is still accessible is grandiose and holds the remnants of volumes and tomes in a range of languages. Domiciles: What was once a well-established hamlet is now in fairly poor shape. As well as in the Fields and the Woodlands, the Naturals left inside of the bubble dwell here. The foundations of most of the homes are crumbling, though there are a few communities that seem hospitable with a little work. Old buildings on the verge of collapse, winding, empty streets, skeletal structures and hidden lanes and alleyways. Ruins dominate the city and make up the majority of its landscape. Exploration is dangerous…but it might be rewarding, too. The Underground:	One of the streets has buckled inwards. Clearing the rubble away has revealed the entrance to a hidden cave system. The Bonebridge:	Composed entirely of stones so white and cracked as to appear like bones, this bridge stretches across an expanse that seems always bathed in mist. To fall into the gorge below would mean almost immediate death. The Settlement : The Settlement is perhaps the only area of the Ruins that looks moderately habitable and not completely run down. This is where the Naturals do most of their trading and where merchants and other peddlers set up their wares for sale and trade. The Outskirts might once have been an extension of the fields, but are now clearly demarcated by the ring-like shape of absolutely barren land. This is largely caused by the magnetic field which was erected around the Hollowed Grounds roughly 300 years ago. Though the barrier is not actually visible, the magnetic resonance can be felt in your bones if you get too close. Symptoms of lingering too near the field include dizziness, nausea and headaches, and increase in severity the longer one is exposed (or the closer one gets) to include vomiting, bleeding from all orifices, disorientation and hallucination, finally to complete cardiac arrest causing death. Fields: While the Outskirts are the most dangerous of the areas around the Spire, there is also fertile ground here. Soft earth and vegetable patches abound, making it an attractive place to grow crops. There are also a few herds of animals roaming. Woodlands: The dense trees in the Woodland seem to stifle all sound making them unnervingly quiet. In some places the foliage is so thick that almost all light is barred from reaching the ground. Oasis: The Oasis is like a piece of paradise in an all but ruined world. A stream rushes out from between the face of two rocks, producing a pool of water which is deep and calm and serene. Some even say that it has healing properties. Though this enchanting forest is rather large, it is not easy to find. Magically warded by the Fae, only those who know the correct paths will ever be able to find themselves in the heart of this lush magical kingdom. Wanderers will simply find themselves turned around and spat out after having delved only a few hundred feet or so into the woods. Regular forest animals can be found in abundance here (animals normally found in temperate deciduous/coniferous forests, such as deer, moose, porcupines, eagles, crows, foxes, woodpeckers, wolves, cougars, etc). Given that very few travelers other than the Fae find themselves in these woods, most of the animals are quite friendly and have lost many of their flight instincts when it comes to strangers. Dozens of hidden pathways seemingly lead to this safe haven, though only those with keen eyes and knowledge of the area will be able to follow them. The thriving heartland of the Fae, much of the ground area is used for communal purposes. A marketplace shields one edge of the village, and the centre boasts a beautiful square which is open to the skies above. The trees are filled with homes of the Fae, suspended as if part of the forest itself. In the evening, their light suffuses the branches with a warm glow. The Observatory: Delicate stairways and ladders cover the trunk of the tallest tree in the village. Nestled in its topmost branches lies the Observatory, where Fae might read the skies or hope to catch a glimpse of Star Whales. The Bodega: A picturesque market of individual stalls set on the bank of a crystal clear river. Undercroft: Deep beneath the roots of an ancient oak, things are not what they seem. This warm, dry underground space contains troves of information; grimoires, tomes and tales of the Fae. The name of this fast-flowing river comes from the oddly shaped rocks which jut out from its depths. When the water and air rush through them the river truly sings in a soft and haunting melody. But whilst life is abundant here, it is as treacherous as it is beautiful. A dense and eclectic maze of trees, the clue is in the name for the Wildwood. It is easy to get lost or turned around, and travellers will often find themselves right back where they started. Brimming with life and illuminated by Will-o-Wisps, this place truly is a wonder to behold. Ludo's Wood:There exists within the Wildwood a thicket of trees where the Fae bury their dead. Lanterns are buried with the bodies so that, in the afterlife, the dead might find their way to Mort and his herald, Ludo. These woods are almost certainly haunted, and the trees grow in a reddish colour with a texture like old skin. Crimson Cataract: A waterfall that begins as a clear trickle plummets from the mouth of a cliff into a vast pool that is entirely crimson. Due to a species of lichen that grows at the bottom, the water appears a dark ruby colour. The lichen is quick to attach to any surface and multiplies quickly. Mathair: The oldest tree in the Wildwood. Notoriously difficult to find, it is said that this is not really a tree at all, but a goddess in her own right. The tree is rumoured to bleed when cut, and bears fruit capable of staving off hunger for days.